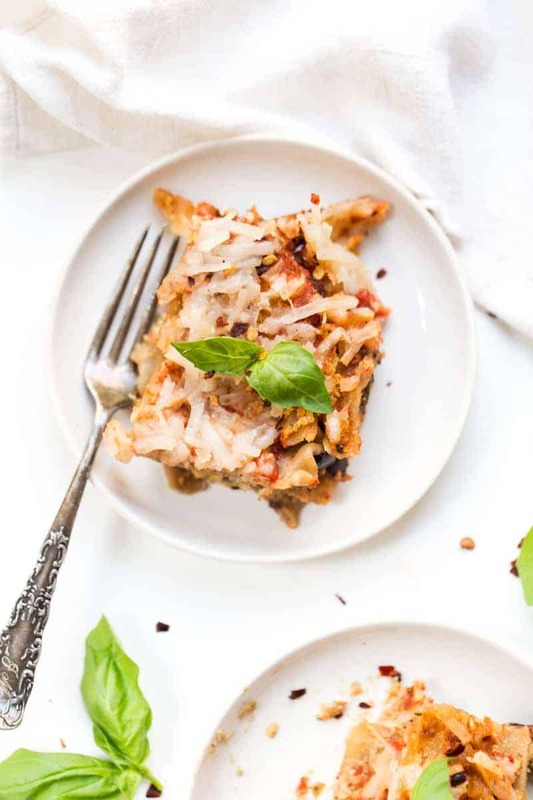 This is the ultimate Gluten-free + Vegan Eggplant Lasagna recipe! It contains roasted eggplant, a homemade cashew ricotta and marinara sauce to top it off! Over the last few weeks, I've been craving Italian comfort food. Likely because my mom and I are headed on a 2-week getaway to Italy in just a few weeks, but also it's starting to feel like fall. And fall means comfort food. And pasta is always my comfort food of choice. 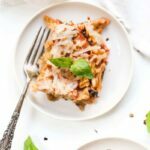 If I had to choose my favorite pasta dish, it wouldn't be lasagna. 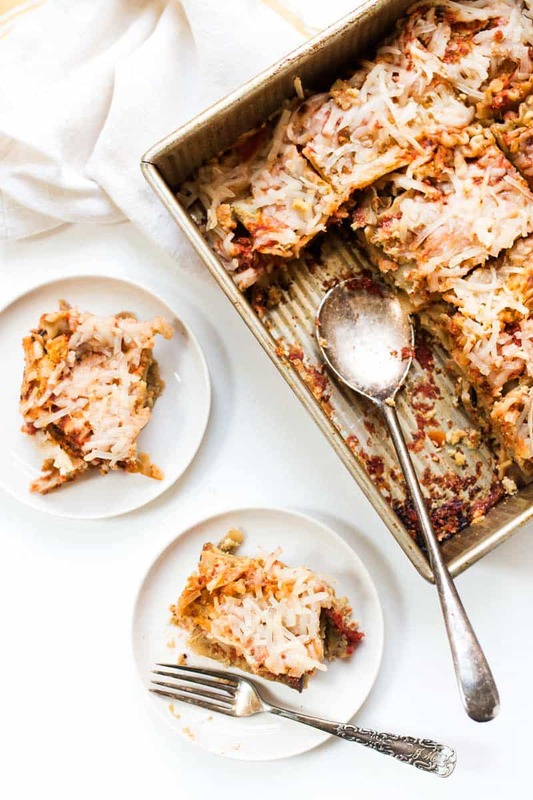 All the cheese makes me a bit nauseous (and obviously doesn't work with my system these days), but when you turn this classic comfort staples into a healthy, plant-based meal? Gimme gimme! 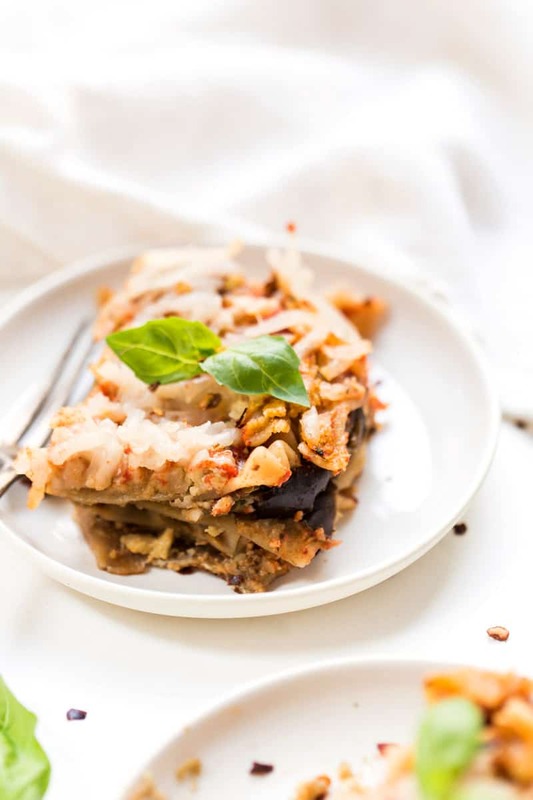 So while I was flying solo this past weekend, I decided to whip up a vegan eggplant lasagna. 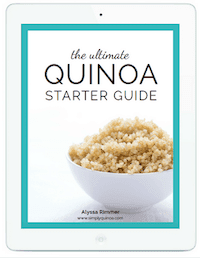 It's simple, nutritious, oh-so-comforting and incredibly delicious! This lasagna is 100% made from scratch. And while that might seem intimidating, trust me, it's so simple. 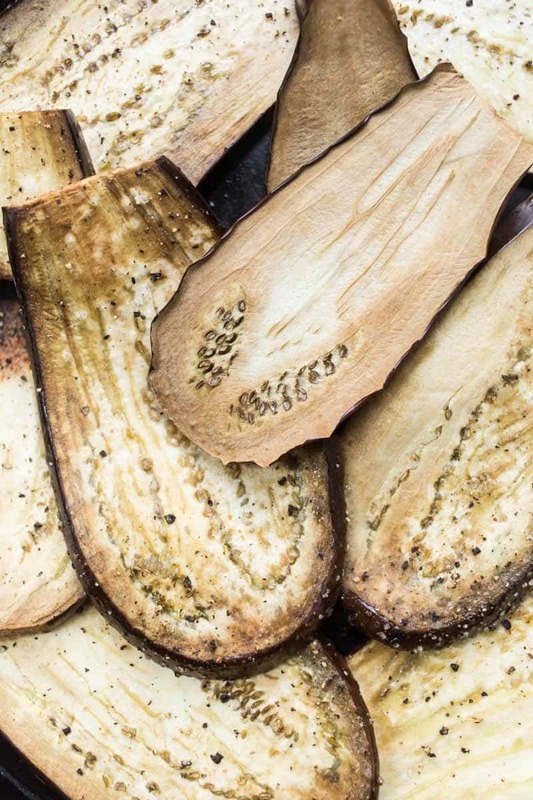 We start with our eggplant which is sliced into strips and gently roasted with a bit of salt and pepper. Roasting it first not only brings out the flavor, but it helps give it this ultra creamy texture that makes the whole lasagna soft and juicy. For the cheese, we're making a homemade cashew ricotta. Cashew cheese is super simple to make as well. 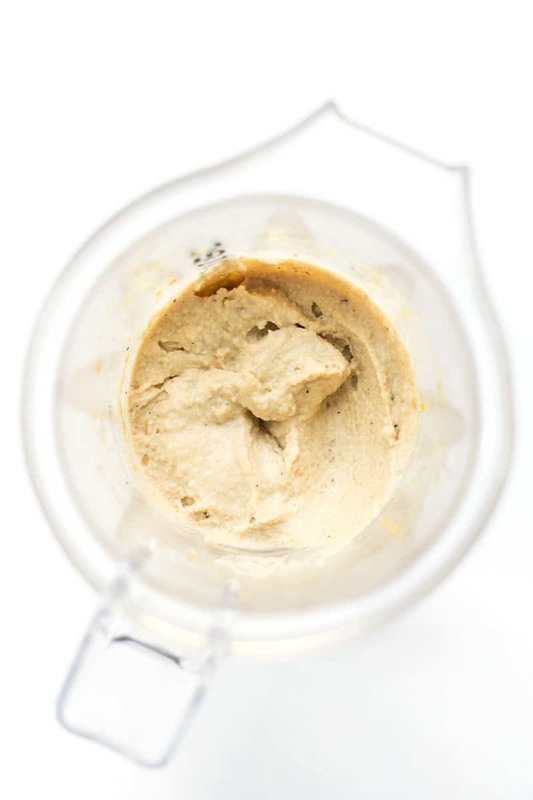 You just soak some raw cashews for about an hour, then blend them up with nutritional yeast (<- gives it that cheesy flavor), spices and liquid. My secret ingredient? Coconut water. Now I know that sounds insane, but I learned it from the chef at the retreat I stayed at in Thailand and it's a game changer. It adds this complex flavor that is too hard to explain. It's just one of those things you need to try and then you'll realize. Coconut water in vegan cheese is incredible! From there it's all about the layering! 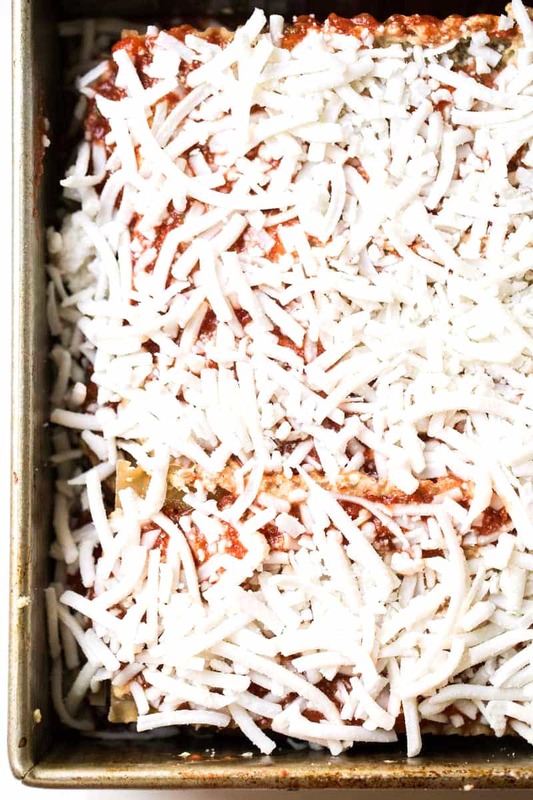 Tomato sauce, gluten-free lasagna sheets, cashew ricotta, roasted eggplant and repeat. 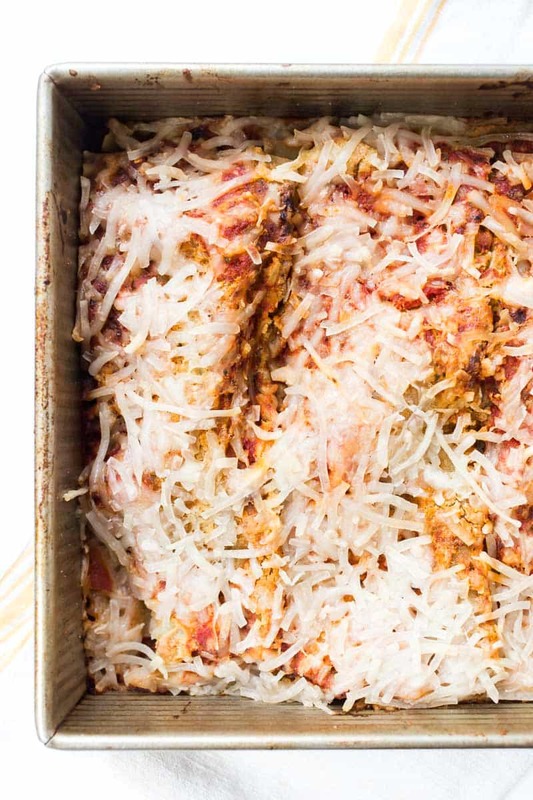 Repeat until that baking dish is filled to the brim with Italian goodness and then top it all off with some vegan shredded cheese. Sit back and relax and wait for your house to fill with the smell of homemade Italian cooking. There's nothing better! And as we move into the colder seasons of the year, it never hurts to have a freezer-friendly meal up your sleeve! Amiright!? This is a perfect meal to freeze and save for later. Either make two and freeze one pan whole, or you can freeze individual squares (which is what I like to do). If you're flying solo for the night, need a quick lunch, or just don't feel like cooking, you can simply reheat a portion in the microwave or oven and dinner is ready! 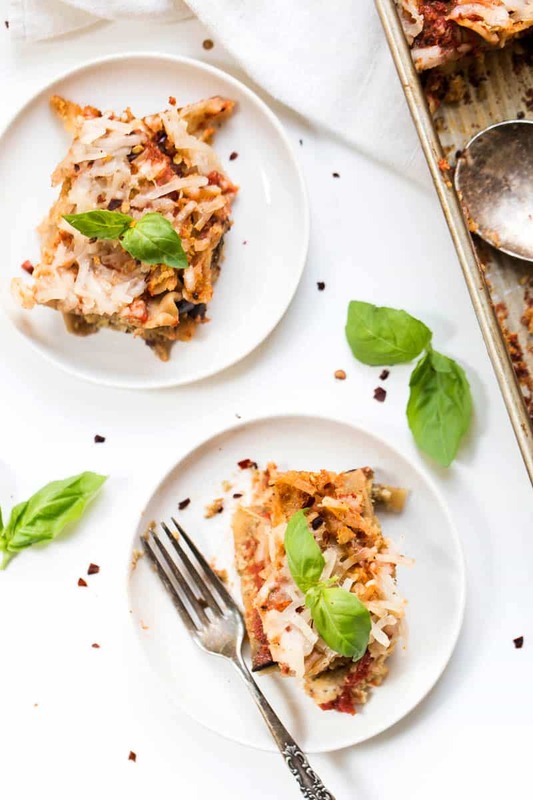 Of course, if you want even more healthy Italian comfort foods, I've got you covered 😉 I definitely recommend that you try my Quinoa Pizza Crust if you haven't yet, my Creamy Italian Quinoa Soup, Vegan Quinoa Stuffed Mushrooms OR my Quinoa + Lentil Bolognese sauce over spaghetti squash. So many options to choose from! And if you end up making this recipe, I'd love to see a picture ❤️ you can tag @simplyquinoa or use #simplyquinoa on Instagram and I”ll be able to quickly and easily find your photo! Slice the eggplant lengthwise and then cut into 1/4" strips. Place on a baking sheet, spray with cooking spray or drizzle with oil, and sprinkle with salt and pepper. Roast for 15 minutes until fork tender. While the eggplant is roasting, drain and rinse the cashews and add them to a blender along with the nutritional yeast, lemon juice, spices and coconut water. Blend until smooth. In a large bowl, combine the tomato sauce and spices. Stir until combined. Prepare the lasagna in a 9x9 pan. Start with a layer of tomato sauce and spread it out evenly across the bottom. Top with three lasagna sheets, then some ricotta. Spread the ricotta out evenly as well. Then top with eggplant slices, additional sauce and repeat until all ingredients have been used up (ending with a layer of sauce & ricotta). Top with shredded cheese. Bake the lasagna covered for 50 - 55 minutes until everything has cooked through and is bubbling. Remove from the oven, let sit for 10 minutes, then slice and serve. Store leftovers in an airtight container for 3 - 5 days or freeze. Do you cook the noodles first before assembling and baking? Made this today and it was very yummy! Thank you. I made this last night and it was definitely yummy. First time having gluten free lasagna… Thanks for the recipe. What kind of vegan shredded cheese did you use? I use one called Parmela Creamery, but I also like Daiya (which seems to be more available)!